No kiln or heat baking required to dry! 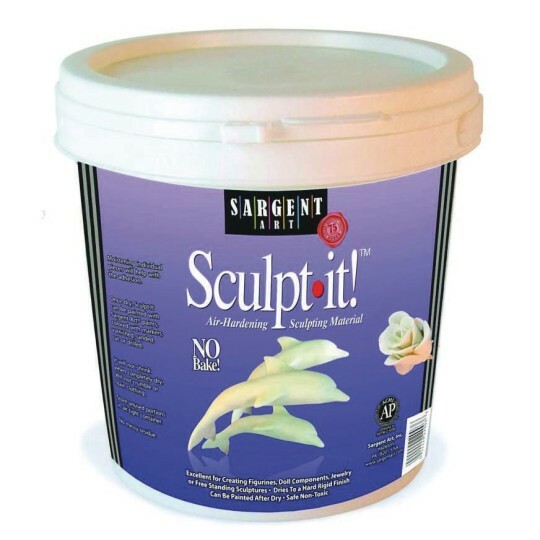 Air-hardening sculpting material by Sargent Art®. Dries to a durable, hard finish overnight. Sculpt it, mold it, shape it. Paint, sand or drill when dry. This clay was smooth to handle. It was very pliable. The best part was when it dried in my plastic molds it didn't crack dried smooth and white for painting! I was looking for a product that allowed me to do a hand print with no mess. The salesman told me he thought this would be a great product for that purpose but it wasn't. It didn't allow the hand prints come through. However I like the product and look forward to using it in the future. I bought this to do footprints with preschool children. The clay was so hard that we could not soften it enough for the children to leave a footprint in it even with them putting all their weight on the foot and teachers pressing on their foot! Easy to handle. Has a very smooth finish. This is the best stuff out there and children with special needs love using it to enhance their fine-motor and creative skills.